Sometimes, restore 2003 Server to different hardware is a practical solution. In this tutorial, AOMEI Backupper is a good method to solve this. I will explain how and why. Why we say restore 2003 Server to different hardware is necessary? As we all know, Windows Server 2003 released in 2003. Ten years passed, Although Microsoft developed many patches of it, some companies run 2003 server still now, their machines are too old! Thus may cause various questions, I think the main problem is that the system runs slower and slower than before. So it is time to update the old hardware to the new one. Hi, every IT administrators, if your computers come out above situation, restore 2003 Server to different hardware allows of no delay. Must though restore to make 2003 Server on different hardware? Only one method? No! You can re-install or clone, but all these ways spend more time than restore. So recover 2003 Server to different hardware is the best way. Traditionally, people think when talk about restore, is the same machine, but now, we noticed that it is different hardware, so is it as easy as before? Dissimilar hardware means different motherboard, different CPU, different hard drive and other devices. Ordinary software can be successfully? To realize this goal, we need a professional tool named AOMEI Backupper Server Edition. 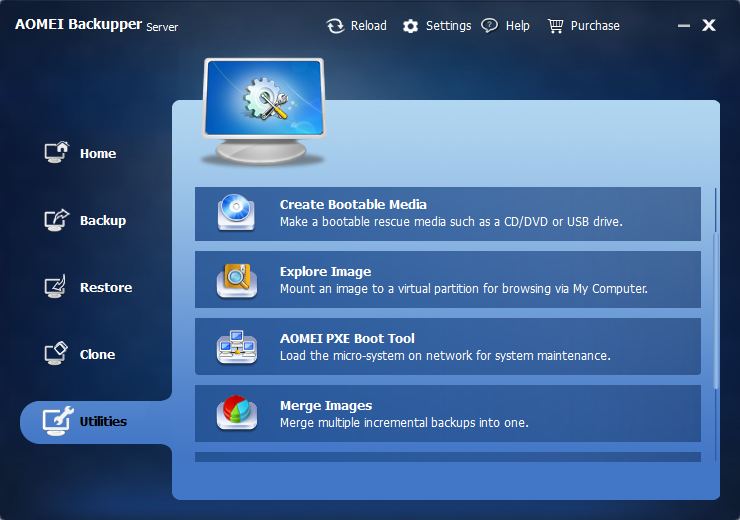 There are several editions of AOMEI Backupper, but the Server Edition is designed to optimize Windows Server OSes as well as Windows PC OSes. Thanks to AOMEI Technology, they developed Universal Restore and add this feature in AOMEI Backupper that makes restore 2003 Server to dissimilar hardware possible and without data loss. Since Windows 2003 Server itself can not restore to dissimilar hardware, so we need to seek third-part software for help, AOMEI Backupper Server with its Universal Restore feature is a good choice. And its built-in program - AOMEI PXE Boot tool, which can help you manage many client machines at the same, so AOMEI Backupper Server is a better choice. All in all, when you plan to restore 2003 Server to different hardware, please try AOMEI Backupper Server!